Our latest project has been oriented to facilitate the work in the transport of heavy loads. A few days ago we delivered an AGV to one of our customers, who will use it to transport wooden boards. This AGV that we have just supplied has a load capacity of 3.5 tons and is designed and manufactured to the customer’s own specifications. 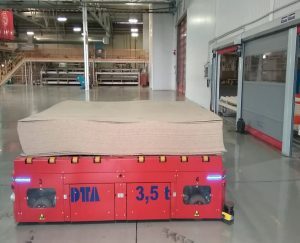 It incorporates a series of longitudinal and transversal rollers that make it easy to transfer boards from the production table to the AGV, without the need to load them. It incorporates a magnetic guidance system that is fully automated from a central box where all and each of the orders are executed. In addition, a series of lasers have been incorporated in each of the AGV fronts to avoid collisions with both objects and people. Thanks to this AGV, our client will save time and effort in the transport of the wooden boards inside his factory, where the use of forklifts will not be necessary due to the adaptability of our product.